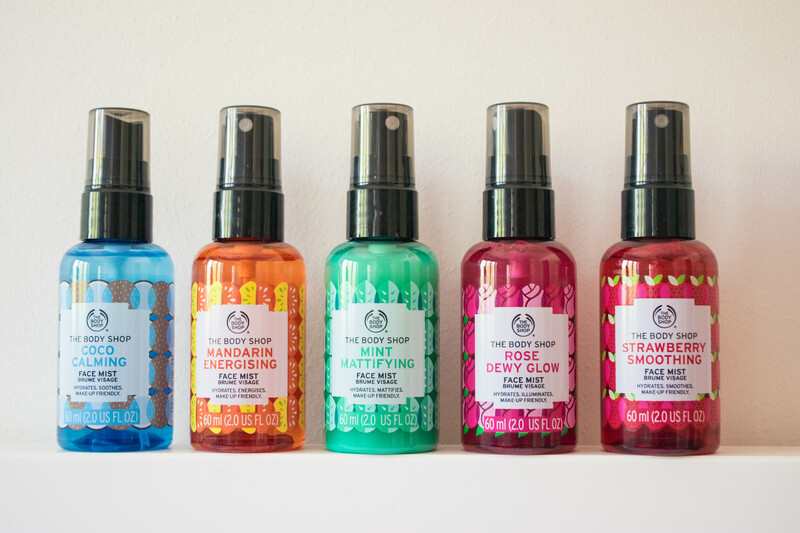 New In from The Body Shop - Kat Got Your Tongue? 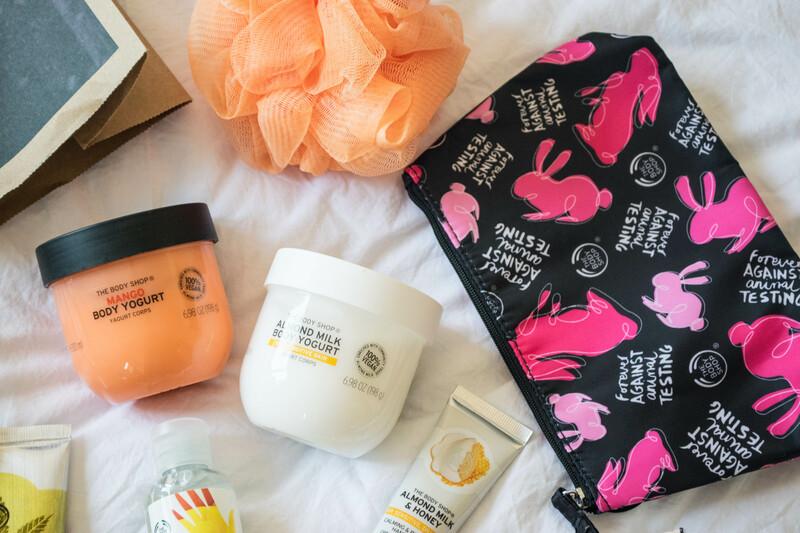 Last week I was invited along to The Body Shop at West Quay for the launch of the new summer ranges, and I came home with a big bag of goodies! 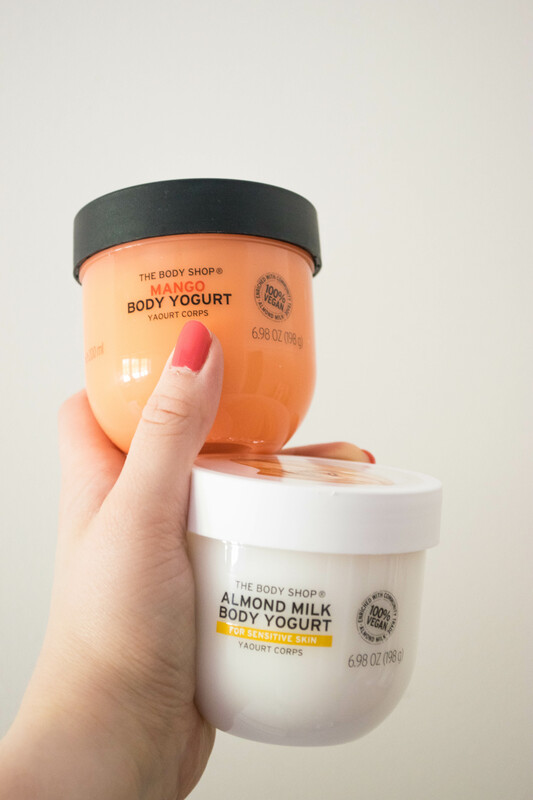 I purchased two of the new Body Yogurts, in Mango and Almond Milk, as well as a shower scrunchie and a little cosmetic bag to support The Body Shop’s campaign against animal testing. Isn’t it cute! 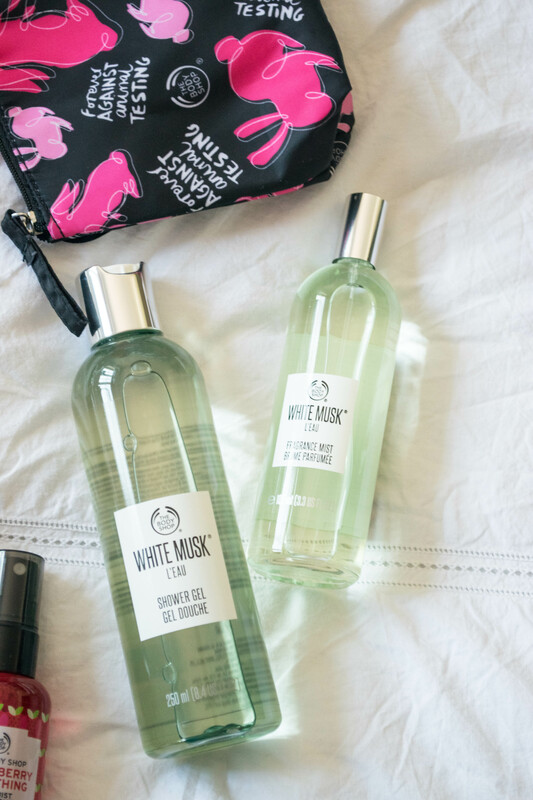 The lovely people at The Body Shop kindly gifted us with a few products – including this White Musk L’Eau Shower Gel and Fragrance Mist duo (which happens to be a favourite of my Mum’s). They also gave us a British Rose Shower Gel, a mini Strawberry Conditioner (my favourite) and a couple of Body Yogurt samples. The Rose shower gel smells very delicate and beautiful, without being overpowering like a lot of rose-scented products can be. 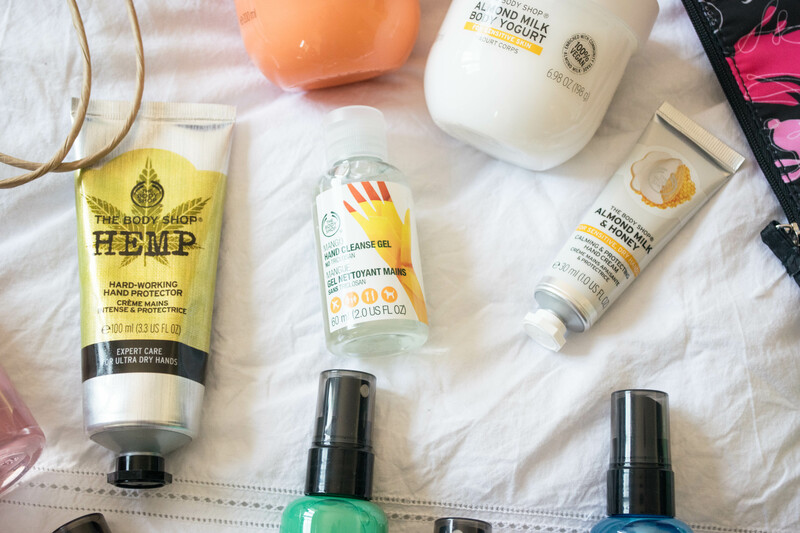 I bought one of the Hemp Hand Protectors – the best I’ve found for really dry, chapped hands – and a Mango hand gel which is really good. I’ve actually discovered 3 more bottles of this hand gel hiding at home! Another gift from The Body Shop is the Almond Milk & Honey Hand Cream, which smells delicious and soaks in very quickly. A nice alternative to the Hemp cream, which can be a little greasy! Last – but by no means least – are the new Face Mists! They are all fantastic – they smell lovely, but not overpowering and they don’t irritate the skin at all. So, onto the new launches – and some of my thoughts about the products. First up – the Body Yogurts. Having tested both out over the last week or so, I’m impressed! They sink into your skin immediately, leaving you hydrated without any greasiness, and the gel-cream texture is so refreshing – perfect for Summer. 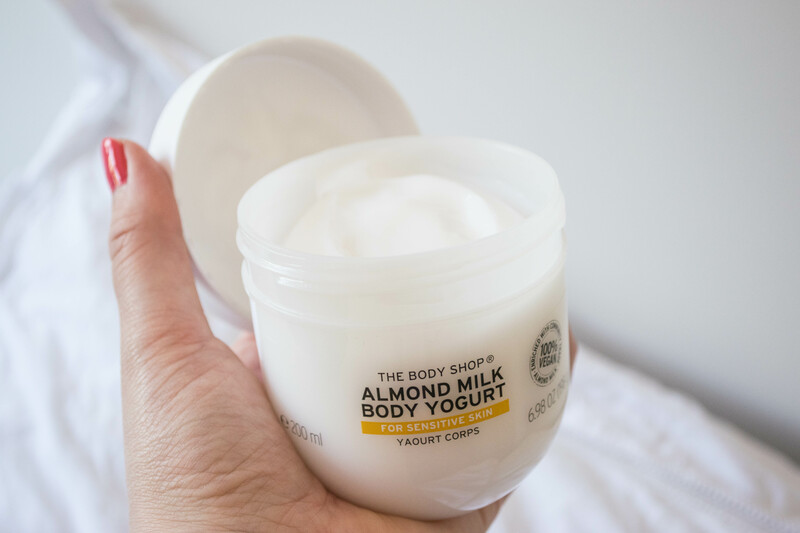 The Almond Milk Body Yogurt is much more delicately scented than the Mango one, but just as beautiful. This one is probably better for wearing with a perfume, as it won’t interfere with the fragrance. If you’ve got sensitive skin, this is the one for you – soothing, cooling and fast absorbing. Lovely! 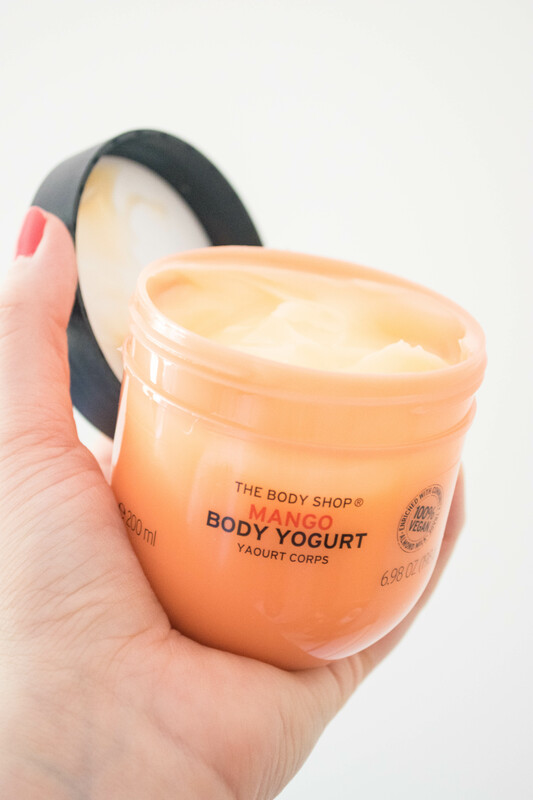 The Mango Body Yogurt smells so fruity, and not at all fake – just like a real mango. It’s actually mouthwatering! The smell lingers on your skin throughout the day (I tend to use this on my arms) and leaves you smelling like you have just stepped out of the shower. So, so nice! The gel-cream is 100% vegan, enriched with mango juice (that’s why it’s so deliciously tropical!) and almond milk. Next up – five glorious Face Mists. I did get a little over excited about these, and ended up coming home with all of them – and I’m happy to say that I’m glad I did! These are hydrating and very refreshing – the perfect pick me up on a hot Summer day, which we’re having a few of at the moment! 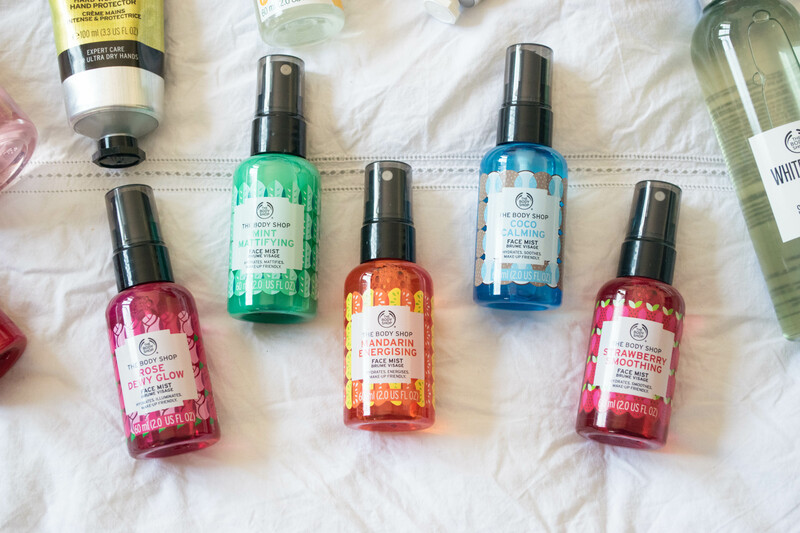 You can pick up the new Face Mists now, at £6 each – and you definitely should try at least one! 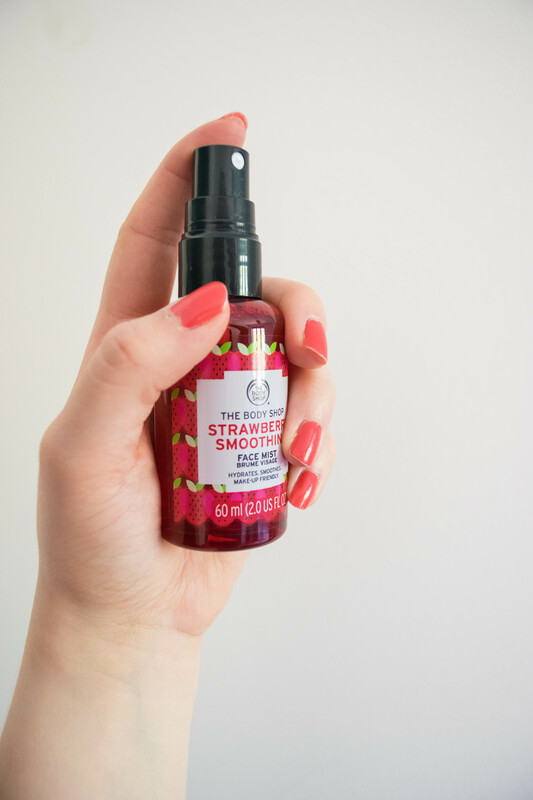 My favourite so far is the Strawberry face mist – it’s refreshing and smells amazing! The spray is also super fine, so doesn’t leave your face soaking wet or ruin your make-up. I’d highly recommend giving this one a go! I absolutely love The Body Shop! I am definitely trying the mango yogurt as soon as I visit there next time. It sounds just perfect and I love the scent already :). That mango yogurt is my fave! Nice to see your thoughts on the new ranges – makes me want to try some new things!